I went through my photos recently and realized I had forgotten to blog about my buffet dinner at Paya Serai in PJ Hilton last year. Normally I don't go for buffets nowadays unless I get 50% discount. Maybe I am getting older and realised I cannot eat as much as before so I actually prefer going for ala-carte meals. Anyway, this dinner buffet only cost me about RM45 after the 50% discount so I guess it was worth it. 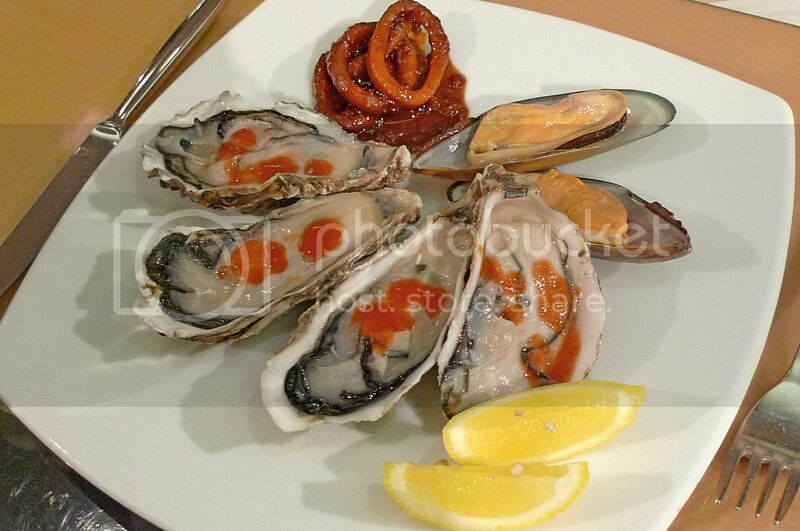 Oysters, mussels and squids - they were nice, although I am not too fond of squids! 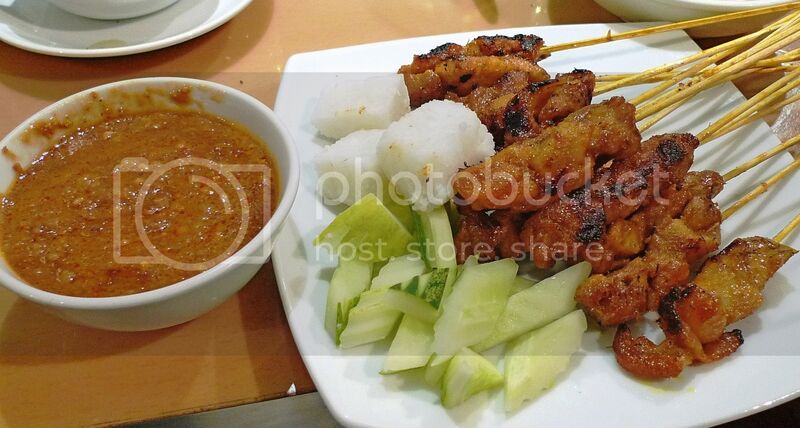 Chicken satay with peanut sauce - love this! But of course still no match with Satay Kajang Haji Samuri. I also ate beef satay (not in the photo) and they were delicious! 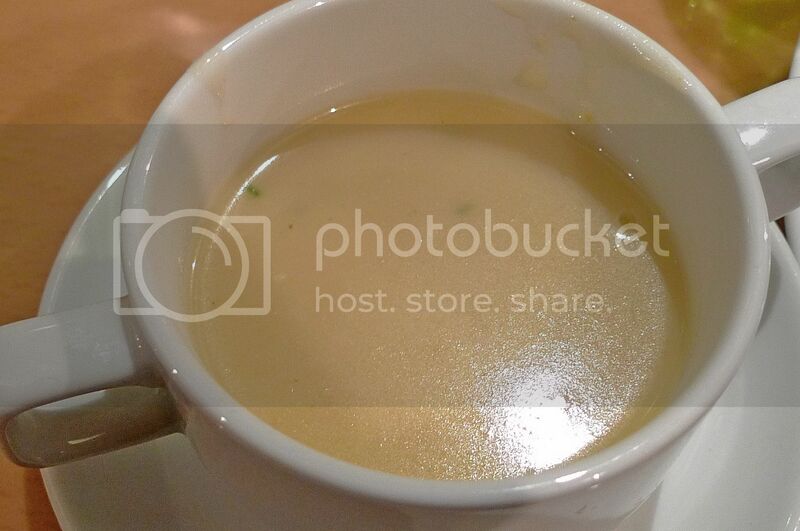 Apple celery soup - This was surprisingly nice! I remember I went for second and third helpings! OK, I honestly could not remember what these were, so maybe you want to help me figure it out? Haha. 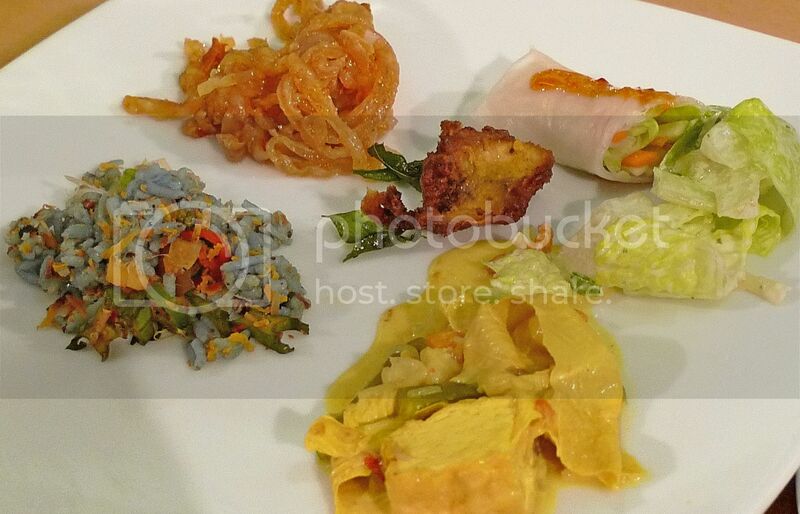 OK, I think the one on the left is nasi kerabu and there's a popiah or spring roll at the top part. I really could not remember the rest! 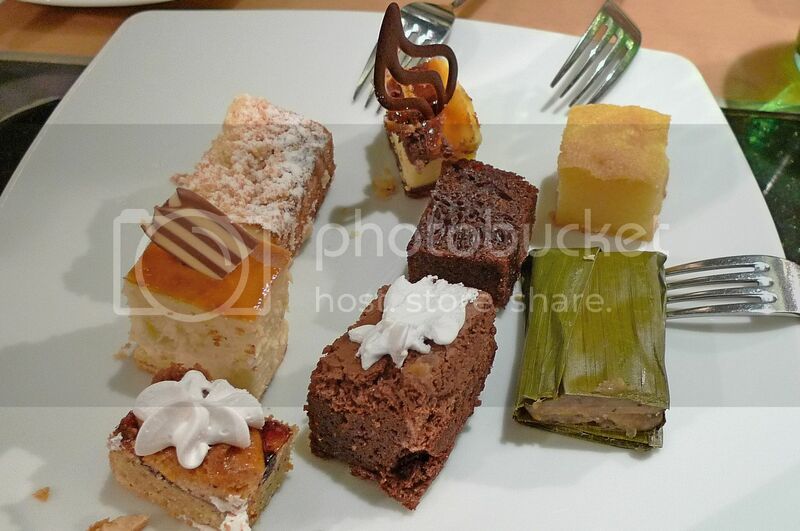 Most of the kueh (desserts) were pretty average in taste. Nothing outstanding that is worth a mention. 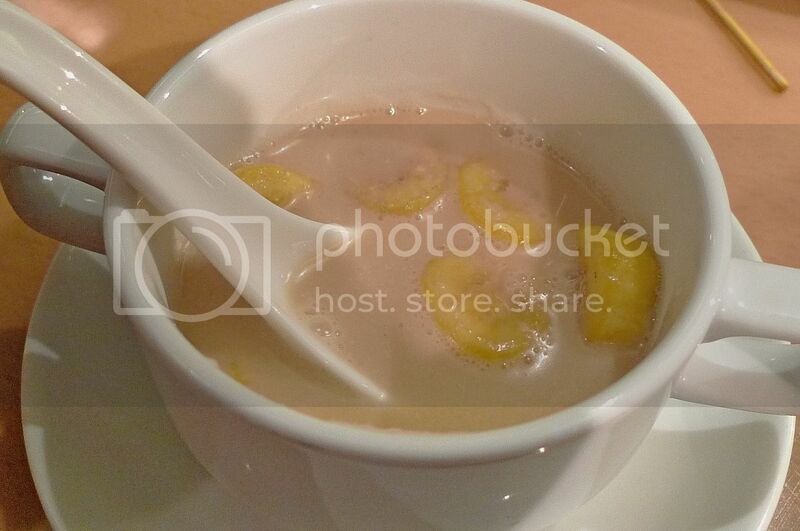 However, I liked this pengat pisang dessert. Can you see the many chunks of bananas inside? Yummy! I am ashamed to say this, but this was my first time eating this fruit called buah pulasan. Did you know which one I am referring to in the photo above? 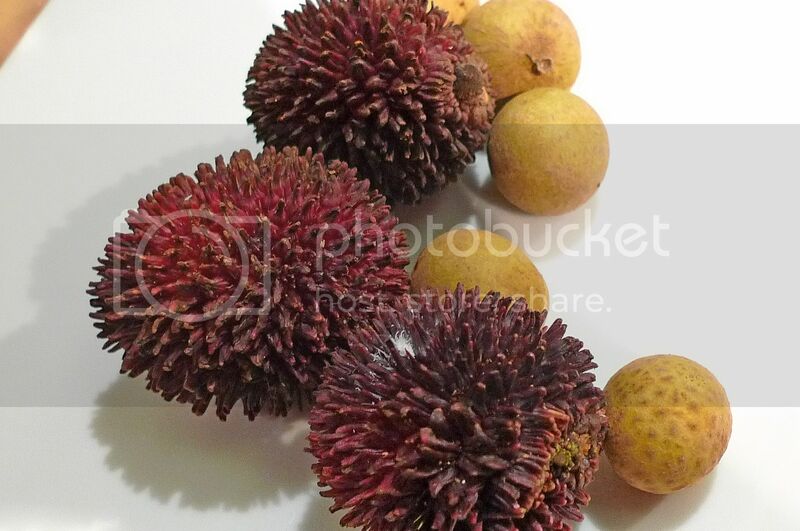 Buah pulasan is the one that looks like rambutan, except that its hairs are thicker like soft bristles. The other smaller fruit is longan or mata kucing. This buah pulasan actually tasted quite similar to the rambutans, but its flesh is tougher and dryer unlike the rambutans which has a moist and softer flesh. I went to this buffet with a group of friends. As usual, we were the firsts to arrive and the last to leave. Haha! In a way, that was good as it allowed me to take some photos of the place without crowds of people blocking the view. Not a bad place this, but unfortunately, I can't say the same for the food, which was average at best. 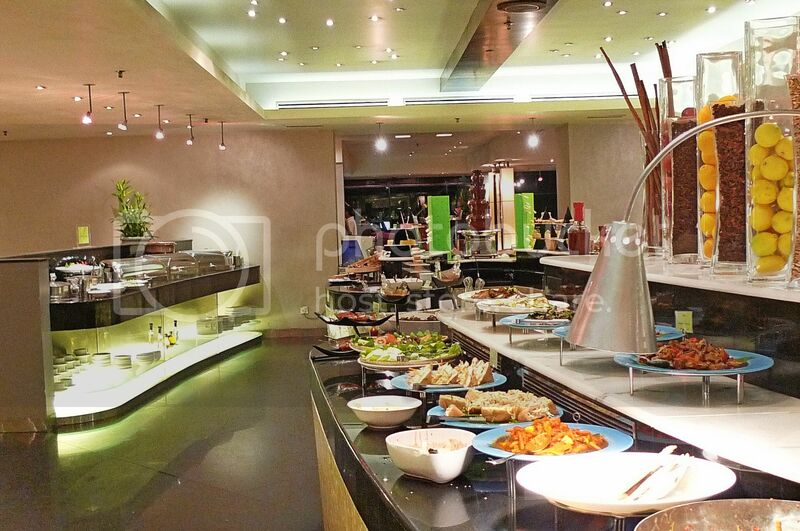 I actually went to PJ Hilton again for another round of buffet a few weeks back as I had another 50% discount. Sadly, I think the food was even worse than before. 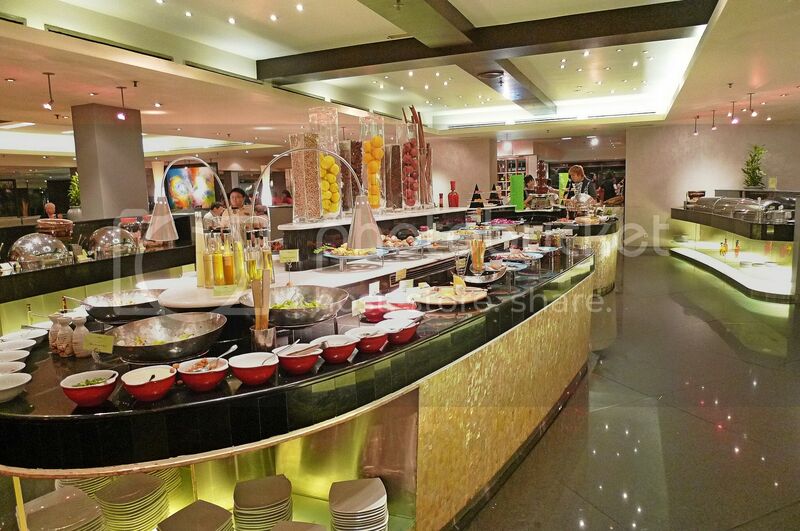 Having eaten the buffet at Shangri-la Hotel's Lemon Garden Cafe, I felt all the others paled in comparison. So no more PJ Hilton's buffet for me, at least not for the next few months! I'm a big fan of raw oysters!! yum! yum! How come they still wanna serve normal satay in a buffet? Beats me... :/They should have serve you guys more exquisite stuff. uwaaa! love those foods!! especially the desserts! sobs i saw pengat pisang thr. So good lah you, always get to get at half price. RM45 is dirt cheap for dinner buffett at least by Singapore standard. And it's seafood they are serving. Place looks posh and the food yummy. Hie Panda! I have just "bestowed" an award to you. Drop by to my site to see what you have received. wah, 50% discount for buffet!! definitely worth a go.. else still need to consider..
the first two plates you shown still looks decent, and the soup also lah since you love it so much..
but the remaining ones especially those you have a little of everything just doesn't look very appetising at all..
anyway i would say the place looks quite cosy and the ambience is nice..
yeah, of course i know what buah pulasan is.. but i've not tried that before, everytime i saw that, it just didn't attract me to eat it.. haha!! oh yeah, the shangri-la's buffet is very nice.. but the last time i ever went for it is like 10 years ago, because i've not been to buffet for many many years already..
maybe 10 years ago, i always go high tea and dinner buffet, because i love to see a mass varieties to choose from..
but as i grow older, i really don't fancy buffet anymore, partly because i can't find any nice ones, and also because i can't eat as much as before..
but once in a while, a buffet is ok for me, especially when catching up with friends, it's a good idea to go for buffet..
Buah pulasan? I have never heard of it. O/T Last month when I was in Sabah, I came across a kind of noodle called Tuaran. That's new to me too. I am not quite familiar with oysters or squids as food. But I love peanut sauce- it’s my favorite with any type of fried item. Hope you enjoyed the food at Hilton. Waiting for your next post. Bye. LOL 17 yrs old only what.. why la feel older? Hmmm, sure or nooooot 17? lol! monica, yeah I love raw oysters too! But the oysters at PJ Hilton was small compared to Shangri-la's!! bluedreamer27, morning! I'm not rich I only ate there because there's a 50% discount! Haha. Oh, you were just like me! I was also hospitalized for eating oysters that had gone bad! Horrible experience so now I only eat oysters that are expertly prepared and fresh. Oh no the food were not served in small amounts! I only took them in small amount. Haha! Cook rambutan jam? Wow! Have never tasted rambutan jam!! tekkaus, nowadays buffet serve the normal hawker stuffs so it's really not worth paying! I took very little nasi kerabu cos no point wasting my stomach space for rice! Haha!! Yeah, you should try the pengat pisang! And the buah pulasan though it's not really nice! Haha! 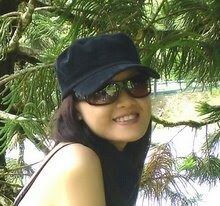 caroline ng, yalah, from 16 to 17 years old - that's getting older what! LOL! I know you don't like buah pulasan cos nothing beats buah tarap!! lina, me good? You better cos someone foot the bill for you! Haha! xin, pulasan is like a tasteless fatty pork? hahaha!! This is the worst description of a fruit I've heard in my life! LOL!! tekkaus, ooh! Thanks for the award! I guess it's more like a tag right? Right?!! SK, yeah 50% is worth it, otherwise I won't go at all! Haha! Yeah, they were not very appetizing to me too! Yes, Same as you - I don't quite like buffet because most are of inferior quality and they are all pricey! 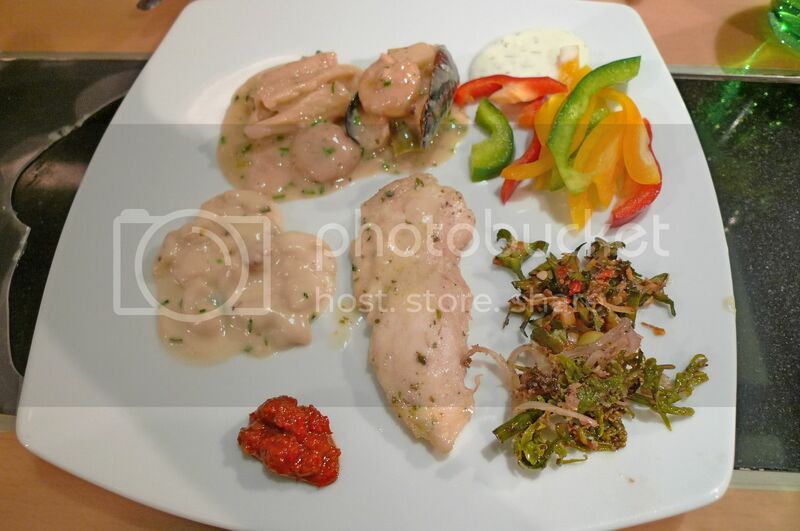 Definitely prefer ala-carte! khengsiong, never heard of buah pulasan? I have heard of Tuaran noodles but have yet to taste it! che-cheh, you can't eat a lot? Then buffet is definitely out for you! Haha! eiling lim, haha! Well, as long as it's 50% discount, I will always consider UNLESS it's really horrible buffet like those found at Legend Hotel KL!!! chrisau, eh toast with kaya - I like! Better than this buffet already! LOL! mariuca, of course feel older lah, 16 turning 17 what! Hahaha!! Used to be great? Is it? I don't really know! Haha! It is a good job to move backward down the lane of memories. All those photos helped you to recollect those moments that you enjoyed in Hilton. The fruits are totally new to me also. Thanks for the post. Bye. u r now making me very hungry! satay and desserts, yum yum! without the 50% disc for buffett, not worth it ya. haha.... i love buffett especially they served seafood (crabs & prawns). Can someone let me know the price of a dinner buffet in Leela or Hyatt Regency? I am planning to take my friend for a dinner. I want to know both Weekend and Weekday price.